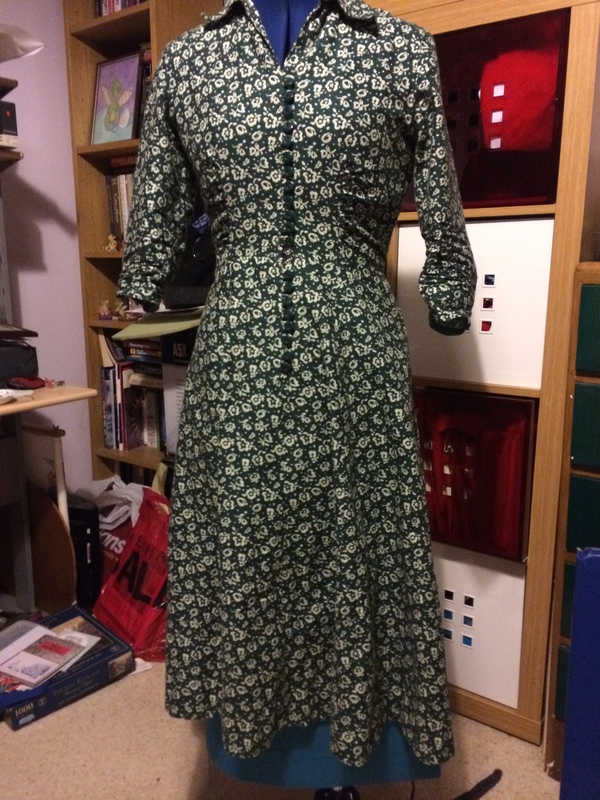 This is my favourite dress so far and I have made it three times, this is the second one I made, I decided to go the whole thing and put the buttons on, the first time I made it, I stitched up the front and put in a zip on the side. The reason I didn’t put the buttons on the first one is that I couldn’t face the 20 button loops, 8 under the belt and 12 above it. 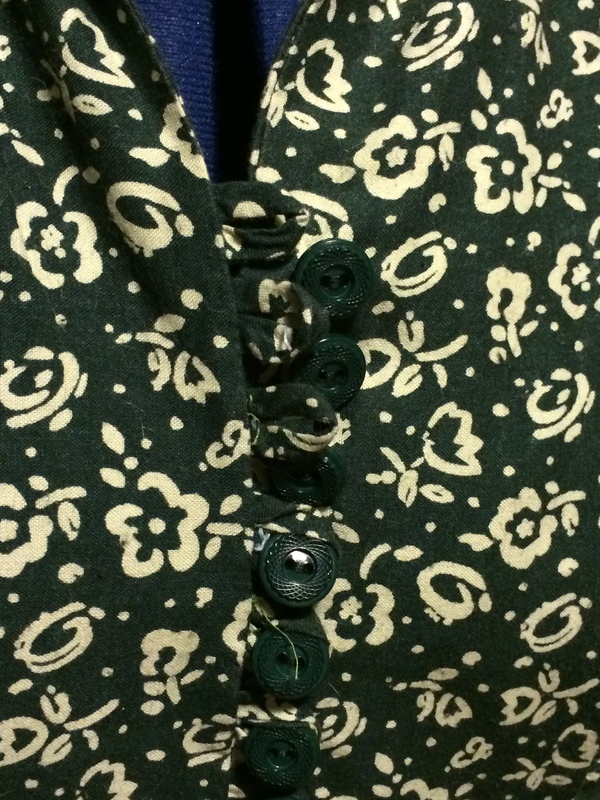 I tried to get a close up on it unfortunately because the fabric is so dark it is hard to see the button loops. Of the many details on the dress I think that the buttons are my favourite, though they aren’t equal space even after spending an hour measuring the darned things. You have the gathers on the sleeves and the gathering on the side panels under the bust, I did have to take it in slightly across the bust but that was just taking a bit off up the side seams. I’m not sure about kimono sleeves, they are easy to stitch together but I always seem to have far too much fabric under my arm. The question is though, is it because I don’t have enough bust to take up some of the loose fabric? or less likely the fabric I am using is just not drapey enough. 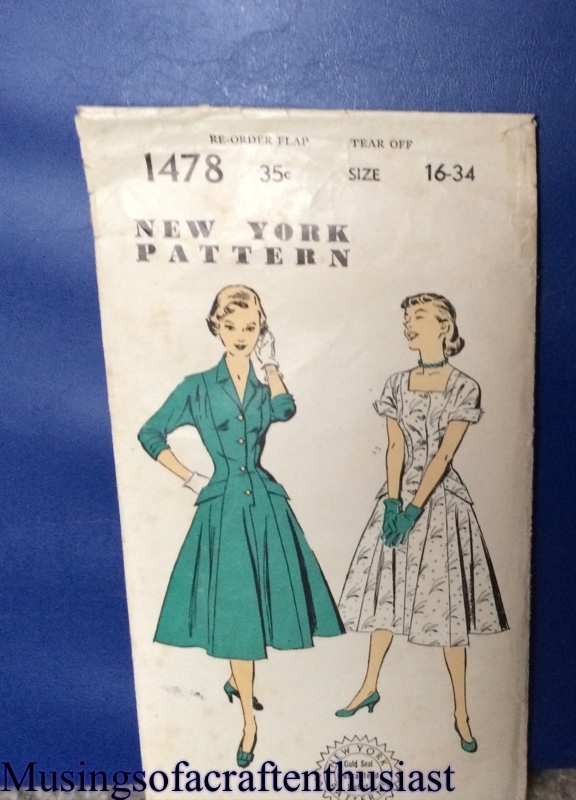 For instance the dress I’m working on at the moment it’s a New York pattern no. 1478 it looks great on the envelope. 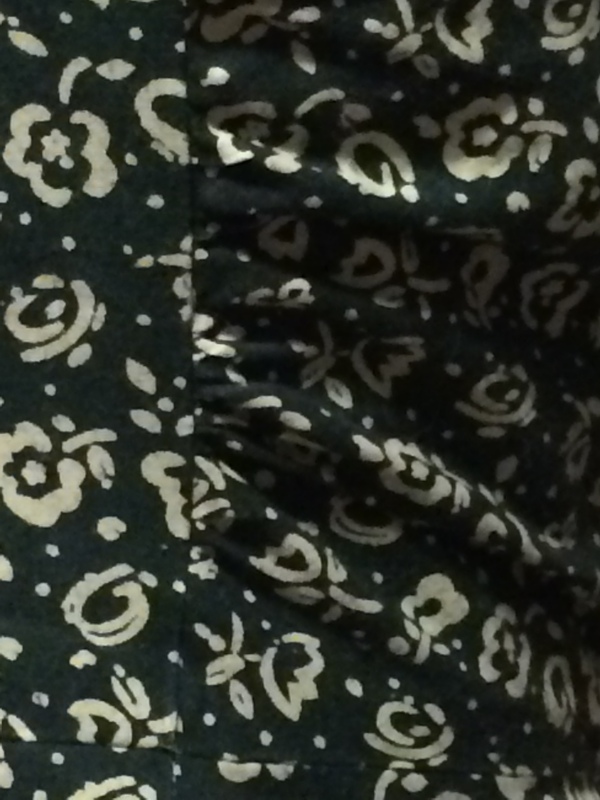 This isn’t a problem with just this dress, out of the five different dress patterns made with kimono sleeves only one of them didn’t have to have 2 inches out of the side seams on either side. I don’t know if this is a common problem, I haven’t been able to find anyone else complaining, maybe I should just get some extra padded bras to wear under these dresses or extra drapey fabric or I’ll just keep taking them in under the arm. I am going to have to set up a better photo studio as the light in here is terrible. 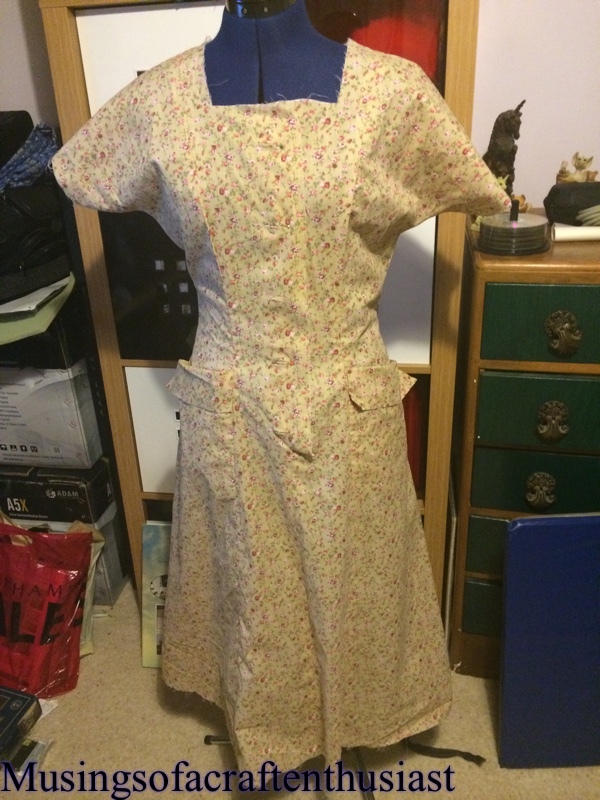 Despite the fabric, I do like this dress, I like the pockets which don’t lay totally flat, I like the pocket flaps and I like the shape, I’m very proud of my first attempt at bound button holes, and thanks to Gertie’s guide to better sewing I now know what I’m supposed to do to the facing behind the button holes. This blog is an attempt by me to help organise my crafting and cut down on my spending, i figure if i am going to announce to the whole world what I’ve bought craft/book wise it will be easier to just say NO. I’m finding setting up a Blog a lot more complicated than I thought. deciding on themes, usernames and colour schemes the people whose Blogs I follow make it look so easy. I suppose you don’t think of all the decisions that go into the Blogs before they get to you they are just there. For instance I wrote a what I thought was a post named it ‘First Post’ Published it does it show up as post? no it does not, it shows up with its own little header and the blog keeps nagging me for a first post. I hope that by the time anyone starts to read this I will have corrected this and also have some posts of dressmaking projects with pictures and everything! !